If you really want to get to know America, you have to travel along Route 66, the famous way to the west from Chicago to Los Angeles. "Get your kicks on Route 66!" Route 66 has been the first highway between Chicago and Los Angeles which has been very important for the people living there as well as for travelers. Built in 1926 for economical reasons it has not only become the main street of the USA, but also a tourist attraction itself. Coming from Lake Michigan you pass through plateaus, valleys, deserts and canyons. However when you drive along the road you feel the joy of life, dreams and emotions of a whole nation. 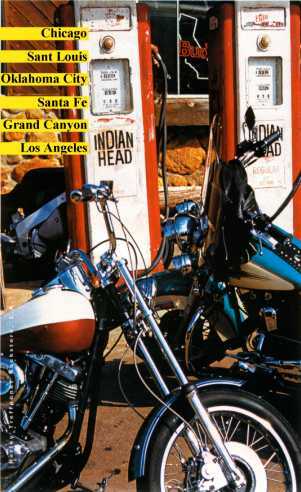 Route 66 also became famous in literacy and music. John Steinbeck for example called it "mother road", but also singers like Bobby Troup, the Andrew Sisters, the Rolling Stones, Michael Martin Murphy and Nat King Cole sang of it. 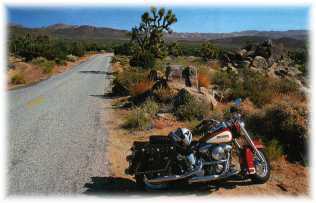 We have already done this journey to the heart of America on the mythical Route 66 for you. So we are able to present the most interesting, beautiful and fascinating places to you. Chicago. Chicago is a real metropolis with more than 3 million inhabitans. Founded in 1830 and connected to the railway net in 1848, it has become a center of wheat- and pig-trade. Today it is famous for its skyscrapers between Chicago River and Lake Michigan which you can see on a guided tour. The highest building in the USA today is the Sears Tower. This office building with an area of 405,000m² is about 443m high. but you can also see the Sulivan Building which is built of bricks. We recommend you to visit "Magnificent Mile" with its exclusive shops and beautiful malls. St. Louis. We choose the US61 to go to St. Louis. Driving through farmland and many small towns we arrive in Springfield, Illinois. After a short break we go on through maize-fields to St. Louis where the Missouri flows into the Mississippi. St. Louis was founded by German immigrants and has today a population of about 500,000 inhabitants. because of this origin there are many German restaurants and beer-breweries. You can use the rest or the day to visit the "Court House", museums, cathedrals or the famous "Gateway Arch" with a height of 192m. Some advise for jazz-fans: Here you can listen to very good Dixieland-music. Tulsa. On the next day we take the I44 through the priarie to go to Tulsa. With its 400,000 inhabitants and more than 860 oil-firms it is called "the oil capital of the world". Oklahoma City. Over the Arkansas River we go to Oklahoma City. On the way we visit Chandler a typical western town. You can also get a "Wild Wild West"-feeling in the "Western Heritage Center" in Oklahoma City. Santa Fe. We leave Oklahoma City in the morning and drive along Clinton with its "Oklahoma Route 66 Museum". The road goes on to the high plains with their buffaloes and grassland. after a short stop in Amarillo, we go on to Santa Fe on the southern point of the Rocky Mountains. It was founded by the Spanish at an height of 2100m. Today it is very popular with tourism because of its acreable climate. Because of the Indian-Spanish-Mexican culture Santa Fe is also well known as a city of artists and galleries. Flagstaff. On the way to Flagstaff we cross Albuquerque with ist historical old town. But we also pass the famous Flagstaff meteorite crater. Grand Canyon. After passing the 4,000m high "Humphreys Peak", we drive into the region of the Grand Canyon, Within the last 10 million years, the Colorado River has created this more than 1800m deep, 6km up to 30km wide and about 350km long canyon. We recommend you to use a whole day to get to know the overwhelming landscape of this canyon. You can wander along the brink or hire a helicopter. But you should enjoy the impressive colors of the sunset. Lake Havasu. First we drive along an original part of Route 66 to Kingman. Then we take the steep and winding Sitgreave Passage to an old western town called Oatman. Our next stop is in Lake Havasu. Barstow. Next morning the way leads us through the dry and hot land of the Mojave-Desert, on the loneliest part of Route 66 to Barstow. Los Angeles. From the Mojave-River-Valley we follow the Cajon Passage through the impressing San Gabriel and San Bernardino Mountains to Greater Los Angeles. We are driving on the Sunset Boulevard through Hollywood and choose Santa Monica Boulevard through Beverly Hills to the end of the historical Route 66: the pier in Santa Monica. Los Angeles is a very huge city with more than 14.5 million inhabitants, but this metropolis on the Pacific Ocean has also got its own flair. We recommend you to visit the "Universal Studios", the "Manns Chinese Theatre" where the handmarks of many stars are, or you visit the "crazy people" in Venice Beach. With a wonderful sunset in Santa Monica Route 66 says goodbye. We are glad to have made it but we are also very tired. Now we understand, why it is impossible to banish old Route 66 out of the hearts and thoughts of three generations of American drivers. Already by driving along this old road once and visiting the real friendly people you can meet here, you become a part of the spirit of the old Route 66.